I had some free time to design and build a cascaded WiFi network for my home. 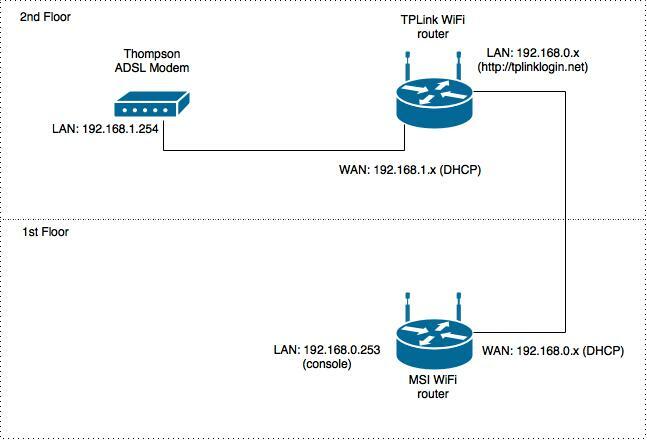 I have recently bought a TPLink router (TL-WR841HP) to replace an older MSI WiFi router because I needed to cover all the house with WiFi. The TL-WR841HP is great, and to be honest I did not actually need to cascade the network because it's Signal Power is rated x4 the conventional routers - so that covered almost the entire house! Having said that, I wanted to dedicate a router just for first floor where I have my Android box streaming HD movies, so I wanted to squeeze all the juice through a singular router (MSI). The setup is shown below and quite self explanatory. If anyone wants more details, just drop me a comment.